End of season/pre-season formalities began on a glorious sunny day in the rolling grounds of Hasland Mansions. Lord of the Manor showed laudable solidarity with his fiefdom by turning down his invitation to Windsor in order to take charge of the reigns of day-to-day affairs and in so doing allow the staff time off to celebrate the Royal Wedding. 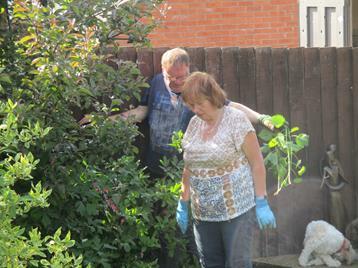 His remarkably humble approach to estate management was clearly evident via his occasional flourish with the secateurs, albeit under the careful guidance of Senior Management. Histon Mariner Logistics Director and Chesterfield Tour Manager (TM) were granted access to the grounds, took advantage of such a privilege and duly laid plans for the rather leisurely, slowly (very slowly) evolving I.T. Policy. Meanwhile His Lordship continued unabated in demonstrating his commitment to the ancient ways of Noblesse Obligee. No task appeared too menial, as demonstrated when proceeding to clean the spilt beetroot from one of his fleet, for which he was allegedly responsible. To complete his determination to acknowledge and reward staff together with those involved in the days I.T. Conference, His Lordship arranged a celebration of the Royal Day with a soirée in his Village Hall in Hasland. From his seat of power a keen eye is cast over proceedings. TM partakes refreshment after his exhausting efforts during the day. TM passes on the villagers appreciation Cheers to Lady Barbara, an even higher authority. The ABBA Tribute Band proved a roaring success, with a rendition of ‘MONEY, MONEY, MONEY’, ringing in His Lordship’s ears he was able at last to ease-off. 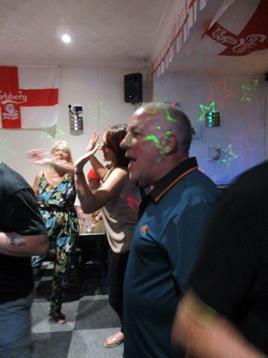 Because of his unyielding duties, Lord Roy had few opportunities to enhance his reputation gained as a Northern Soul dancing aficionado even when the appropriate “DANCING QUEEN” was played. To have witnessed his efforts over the whole day was truly an honor and fully justified a celebratory nightcap and the gratitude of all and sundry, to the Squire of Hasland. 06.07.18. 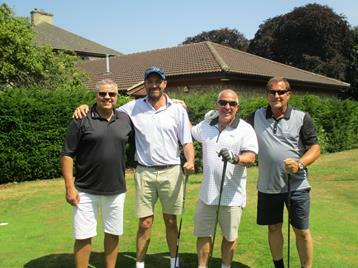 Grimsby Town Annual Golf-Day. 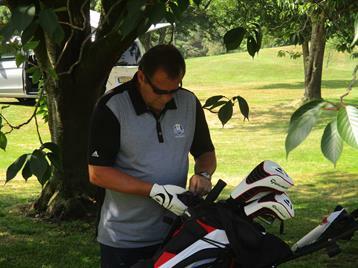 Arranged largely by Steve Fenty for the Youth Development Fund. 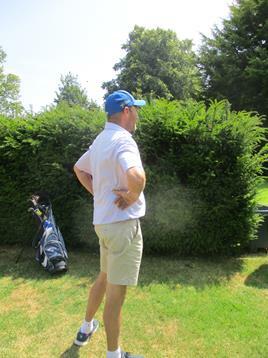 For the 3rd Year the Histon Mariners entered a carefully assembled foursome, this year under the natural born to lead and astute Captain, Steve ‘Sloppy’ Allsop. Messrs. Tim, Allsop, Pearson and Dickson justify the use of a wide angled lens. .......Mr.Dickson checks on the time of dinner. Whilst the 4 stooges set about the course, first lieutenant Sean continued to display his 24/7 work ethic.This ethic instilled by years of diligent learning from a true Master, manifested itself in an audacious marketing exercise on behalf of his Mentor. 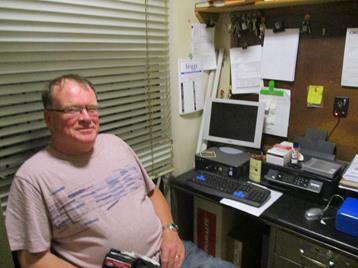 Accompanied by Histon Mariner Logistics Director on an exploratory venture, the opportunity was taken to visit long established associate Mariner, Will Douglas. The development by The Axholme Brewery (WWW.axholmebrewing.co.uk) of Dock Beers (WWW.dockbeers.com) is an exciting development in King Edward Street Grimsby, the visit was the first of what is likely to be a fairly regular visitation. 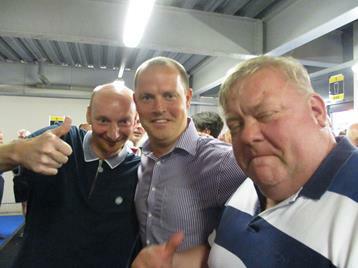 Sean was ever more appreciative of the Histon Mariner Campaign. A rather pedestrian performance on the Golf Course resulted in a 7th plaice finish but did little to deter Mr. Dickson reviewing possible improvements in next years preparations. It is believed A.D. considered Tim’s secret stash of chocolate bars - “in case of emergencies” - a very forward looking strategy but could be improved upon by replacing chocolate with pasties. At The Smugglers, Mr. Dickson reviews catering arrangements with an enthralled Tim, a not so enthralled Captain and a restless Mr.Pearson who appears even less so and desperate to perform. Soon the restless Mr. Pearson unexpectedly proved an admirable replacement for last years virtuosos performer, Mr. Daniel Grainger, a dancing sensation at The Kingsway Club. Mr. Pearson proved to the vocal gods what Mr.G did for the dancing gods last year. .....as Mr.Dickson left to search for pies, Sloppy stare in disbelief as Tim and Sean enthuse at Mr.P’s performance. As the crowd erupt, Sean announces to anxious fans, just one more number from an exhausted Mr.P. 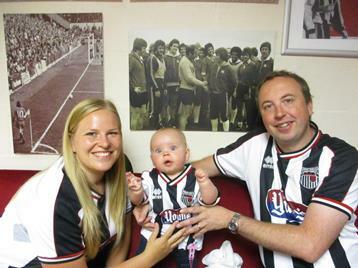 Simon Kingsway and wife Karen thank the Histon Mariners for unveiling another performer destined to become a local hero. Even when proceedings appeared to drawing to an end, the snowball affect of Mr.P’s outstanding debut was evident. Fellow entertainers flock to meet Mr.P. which provides Mr.Dickson an opportunity to order a pizza. ......a possibility not lost on Sean and Tim !!! At the, outset of a wonderful summers-day, on the first day of a new season, hopes, expectations, desires and dreams are understandably at their zenith. How quickly the return to normality — the absence of Willy’s at the pre-match conference was perhaps a sign of things to come. Before kick-off, friends and associates of the Histon Mariners joined together to wish the Campaign well over the season ahead. 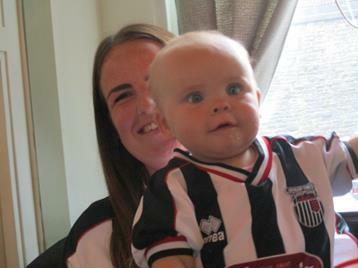 Grace, resplendent in new kit, experiencing a first day with Mum. Even Dad looked vaguely optimistic. Grandad soon provides a Lordly sense of realism, with youthful exuberance abundant. 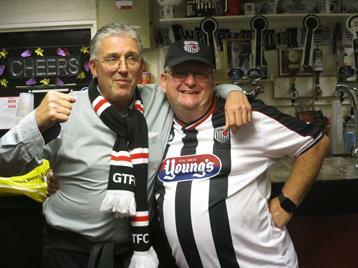 Jon Wood, welcomes the Histon Mariners on behalf of Town’s Board and passes on best wishes to an absent Chairman. 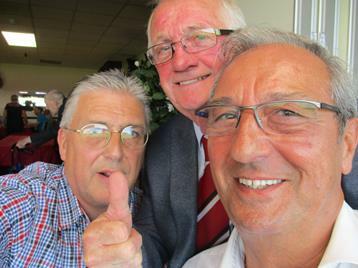 Town Legends Dave Boleyn and Dave Worthington give the thumbs-up to the Histon Mariner Campaign. 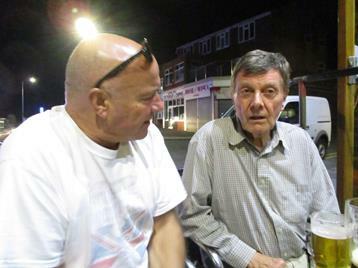 Pete Roberts and Dan listen to travel monologues from The Trusts resident foreign correspondent. 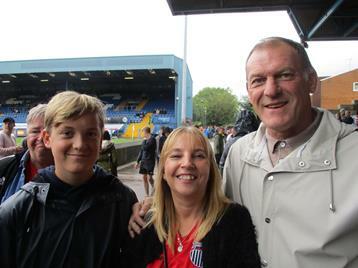 Town at one up, the belief on and off the pitch seemed a given - last seasons run in appeared to be continuing, even a Mitch Rose penalty seemed a neat connection Conceding 4 (four !) goals had a profound effect on expectations. The third and fourth in a 10 spell 5 minutes from the final whistle, left Blundel shell-shocked. We can only assume a blip — perhaps a good reminder of the long trawl ahead, a re-focus and some transfer business still to be conducted. 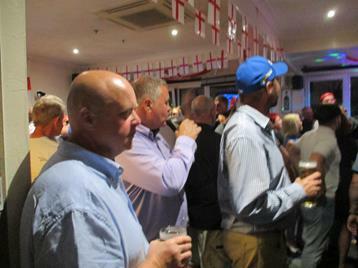 Post-match, in the Smugglers, the faith remained. 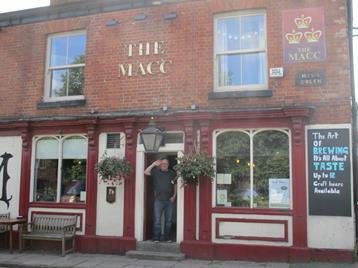 Whilst Antique Steve ponders “THE LONG AND WINDING ROAD” ahead, Sean toasts a restart, next week at Macclesfield. 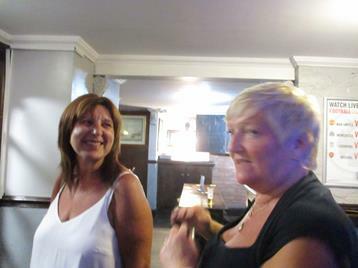 Smugglers Landlady Extraordinaire, Julie, looks anxious yet overjoyed at the thought of another season and welcomes the support of Mrs.Fish. The disappointment of the opening day is soon put into context as Kingsway Simon provides joyous and enthusiastic support. The Jolley Era must be viewed long term. Already long term injuries (Whitehouse and Cardwell) have disrupted plans, resulting in likely later than desired forays into the loan market. The road ahead with a new and essentially young squad is going to one of considerable ups and downs, before a degree of consistency is achieved. 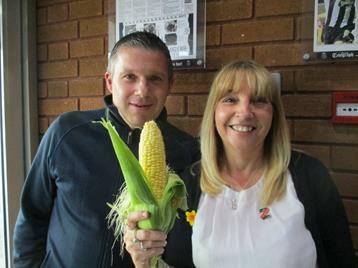 “COME TOGETHER” for Jolley times ahead. Macclesfield was voted in The Times 2004, the least cultured town in Britain, based on its lack of amenities — rather unfairly! The football club b.1876 by virtue of a merger of the Olympic Cricket Club and the 8th. Cheshire Rifle Volunteers. First escaped from Division 5 in 1997 after a false dawn in 1995 and after relegation in 2012, returned to the 4th. Division in 2018. 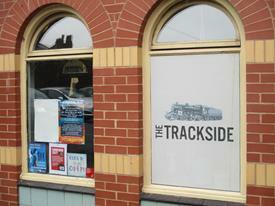 Macclesfield is the home of Joy Division and elements of New Order. Blues Godfather, John Mayall also originated here, citing “Blues From Laurel Canyon” rather than “Blues From Moss Rose”. Macclesfield born sporting legends include Peter Crouch and Jonathan Agnew plus Mariner legend, Chris Nichol. Recent players for both sides include Martin Gritton, Conner Jennings, Jack Mackreth and Luke Summerfield. 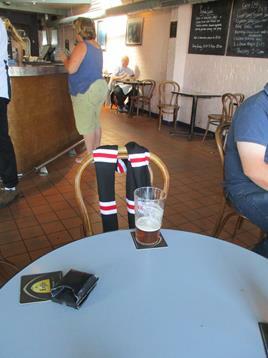 The Histon Mariner journey north found acceptable resting spots before meeting up for a full and proper pre-match preparation at The Mack. Lord Roy is on hand to welcome his subjects aboard. Such was the dedication of the Chesterfield Mariners, that the previous day witnessed a full training session at which Lord Roy spoke publicly about future arrangements and bridge building with other supporter groups. His leadership qualities came to the fore being underpinned by a an open mindedness rooted in successive generations of ‘good stock’. The success of the day provided inspiration for all, plentiful and sustaining refreshments and a dowry that builds a bridge between The Mighty Mariners and The Spirites - an act of generosity made a little easier by Mad Dogs inability to “inspire the Spirites”. Evidence as to the success of the day will no doubt be revealed in future harvests. 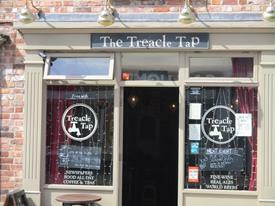 Inside The Mack, little attention is paid to the ramblings of a slightly fatigued Lord. 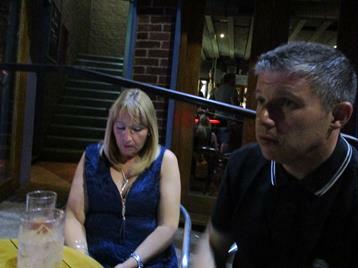 York Mariner Dave, is briefed by His Lordship and is updated by I.T. Guru Tefman. 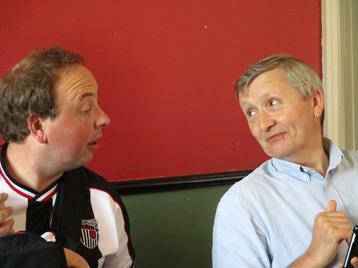 Doncaster Paul listens intently to an illuminating diatribe from Gareth the Engine. 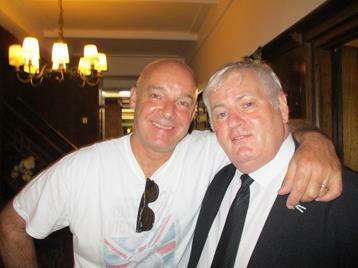 Cleethorpes Terence in full support of the Histon Mariner Campaign. Inside Moss Rose the regularity of the B&W Army never fails to impress. The troops were keen to celebrate a restart to the season, declaring it “GOOD DAY SUNSHINE”. A brace of joyous Roberts. 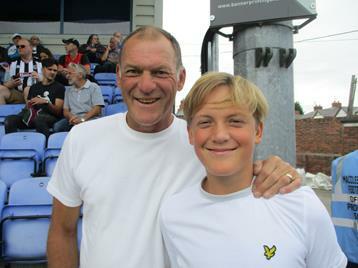 Former star Andy with Histon Mariner sponsored future star Henry Moore. Last Week Chalk, This Week Cheese ! A competent, disciplined, resilient performance was enthusiastically welcomed. Alex Whitmore appears to be growing into a no-nonsense commanding presence at the back. John Welsh has clearly played at a higher level but will need legs around him - we will have to wait to see if this can be accommodated. Last week an early contender for ‘bizarre own goal of the season’, this week a ‘possible goal of the season’ from Jordon Cook, gave Town a deserved lead. If the goal is not goal of the season, the winner will be truly exceptional. The Hess brings a controlled and competitive edge which was very much called upon in the second half as Macclesfield fought to re-establish parity. “SUBSTITUTE” Charles Vernam sealed a deserved victory with a tenacious solo effort. A terrific response to the opening day Blues - “I SHOULD HAVE KNOWN BETTER”. The Campaign for Real Football continues on several fronts unabated. 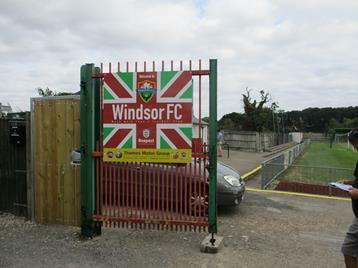 The Histon Mariners paid a most agreeable visit to Stags Meadow, the former home of Windsor & Eton F.C., now the home of Windsor F.C. since formation in 2011. 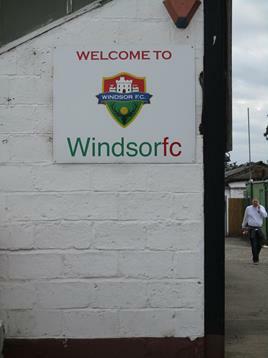 Down 3 v 0 at half-time, Windsor eventually won 4 v 3 against Royal Wooton Bassett Town. A young Daniel Roberts (no relation!!) impressed up front for Windsor. 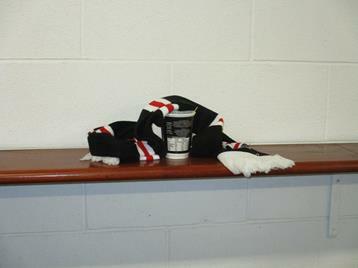 Hospitable refreshment facilities and contact with Real Football People (RFP) gave great credence to the Histon Mariner Campaign. A “TICKET TO RIDE” from Cambridge, renewed optimism, glorious weather, sustaining hospitality and a good result, reiterated why we so much wish to associate with Real Football. An absent Chesterton Mariner, Tefman, adhered to these principles and accordingly punished The Dons by deflating their pie sales. 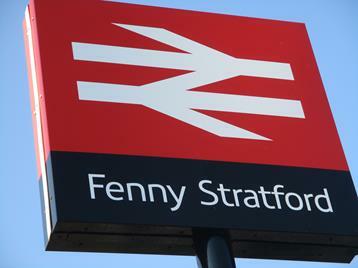 Having arrived at a rather dry station, local intelligence suggested rest and recuperation would be best facilitated at nearby village, Fenty Stratford. 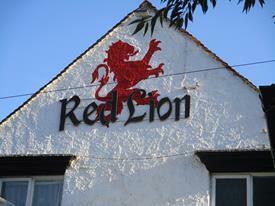 Superbly located on a lock on the Grand Union Canal, the Red Lion provided a most refreshing traditional lemonade. 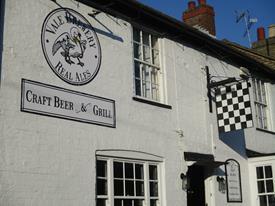 But the real star venue discovered - and noted for future visits - was The Chequers, tap-room of Vale Brewery. Excellent vitals and fruit-smoothies, sustaining the belief that an army marches on a satisfied stomach. The good vibe continued into Stadium MK. A mournful Lord Roy laments he principled absentee and also failed to appreciate “Tales From A Travel Guru”. 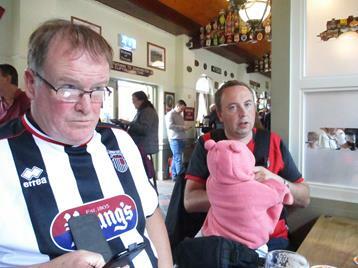 Imperial John, Northampton Mariner Gareth and a contented Geordie Daz anticipate further progress. Sutton MarinerJack shares a flat white with new recruit Beckenham Mariner, Zac. An outstanding first-half, leaving those thinking of the opening-day fixture, bemused. This time not only organization and shape but a display to substantiate rising expectations. Whitmore looks more at home with every game. The Hess with his competitive edge looked to have the legs to complement the experience of Welsh and Woolford but for how long? Jordon Cook again gave the Mighty Mariners the lead and is hopefully laying the foundations for a fruitful season. Such was the extent of Towns performance that a two or three goal lead could not have been considered flattering. However as in the previous week, to play so well and fail to capitalize is a concern, Inevitably opposition will come out for the second half determined to make amends. Sure enough it took The Dons only 30 seconds to restore parity. Backs to the wall resolution secured a deserved point and whilst the overall performance encouraged many positives, the concern exists about a failure to capitalize when on top. Such a performance always shortens the journey home. 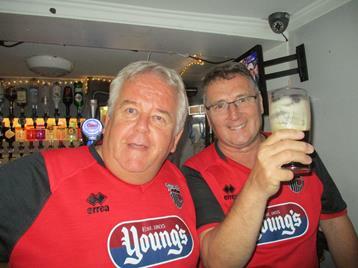 Doncaster Paul ensured the departure of Histon Mariner Logistics Director who eventually joined Putney Mariner Sean and Wimbledon Mariner Dan for a contented post-match analysis. The B&W Army marches on, its “GETTING BETTER” all (some of) the time. A very enlightening journey north with old (very old) associates of the Histon Mariners culminated at Cleethorpes bass-camp The Kingsway. 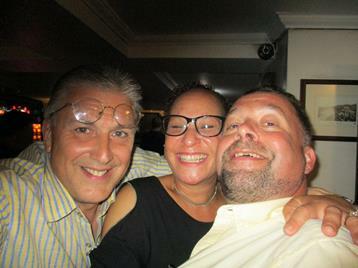 As ever Willy’s would host the first port of call, much to the pleasure of returning patrons Messrs Balham and Hall (B&H). 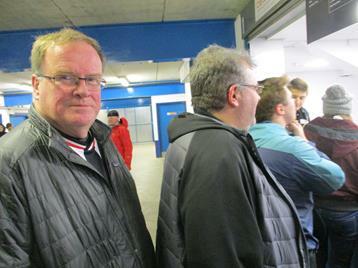 A rather shy, allusive Chairman chairs a pre-match meeting. 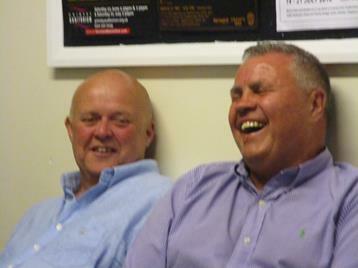 As ever the Histon Mariners enthuse at his charming and erudite analysis. 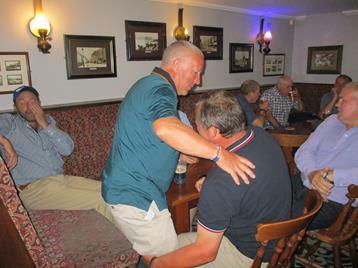 Before departing Innkeeper Bill thanks the Logistic Director for his on-going efforts. 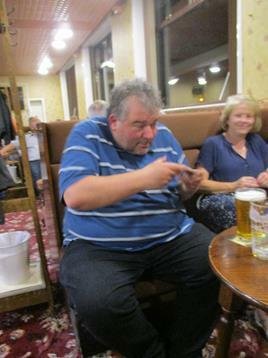 En-route to the Notts., Mariners Will and ‘close associate’ Doug welcome the return visit of Girton Mariners, B&H. 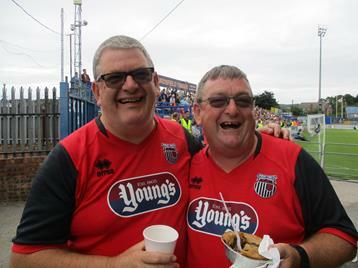 Tea and cakes at the Notts presented all concerned to catch breath after an exhilarating start to the day. It can not be empathized sufficiently, the gratitude of the Histon Mariners that Mr.Hall had taken time between his multitude of foreign excursions to contribute to the Campaign - though evidently he now regards Cleethorpes as one of his many exotic excursions. Mr. Hall looks on in utter amazement at the road ahead, whilst Mr. Balham struggles to contain his excitement. The Girton Mariners were visibly moved at the welcome their return to Cleethorpes invoked. 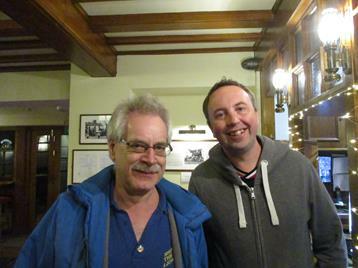 Michael Jolley and Dave Smith immediately sought out, to welcome Girton Mariners B&H. The Girton Mariners were astounded that their Girton associate Mr.Tabor, now had a look-a-like following in Cleethorpes. As kick-off approached, Mr.B. studies form. Concerned at a forthcoming short-term absence, Leeson looks for a steady hand on the tiller. Histon Logistics Director welcomes his guidance. Whilst not exciting, the Mighty Mariners appeared largely untroubled by The Glovers. Starting off as the brighter team, though still struggling to find the piece of creativity that breaks deadlock. Overall a stalemate first half was superseded by a second whence Town conceded the only goal from a re-organised Yeovil to which Town essentially didn’t adjust. No complaints about the result of a rather low key affair. Fundamentally the game re-iterated “a new team, a team in transition”. A Tale Or Two Elliot’s — one appears to be a major long term absentee, sorely missed - Whitehouse. The other subsequently arrived short of match fitness, but when up to speed looking like the player of considerable creative alent surely needed - Embleton. 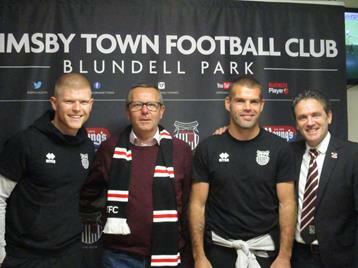 It is patently obvious Town need goals - but again optimism is not unfounded. With supply enhanced by Embleton, perhaps a front two of Thomas and Cook, Town’s ascent in the right direction looks more likely. 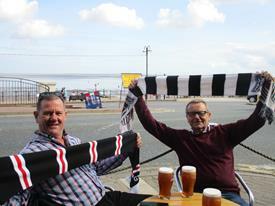 Predictable disappointment descended post-match over Cleethorpes. A belief exists that there is a team within the squad. Excuses aside - injuries, suspensions, difficulties in the transfer market etc - have not helped. We may or may not have had it worse than others, and M.J.will be as aware as anyone but he must stick to his convictions and await the rub-of-the-green to see things turn around. Everyone accepted the project was a long haul, that the inevitable ups and downs would have to be endured with stoicism, so we should not be surprised with how events are unfolding. To repeat, we believe a team exists with in the squad. M.J. assembled the squad, which after one transfer window cannot be the finished article. After less than 12 months at the helm the B&W Army must stick together back M.J. and continue the march forward. Soloist Sean, laments both the loss of 3 points and the loss of an ‘old antique. A Tale Of Two Andys. 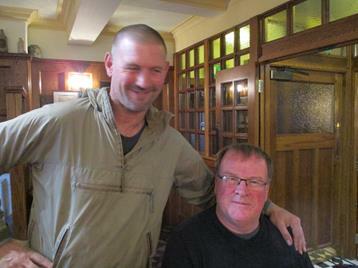 Town legend Andy Moore remains up-beat with a down-beat Andy Murray aka Moza. After valiant efforts, and in need of deserved rest and recuperation, Andy M. is collected by Histon Mariner sponsored Henry whose future can only benefit from such an example. Mr. Balham accepts the baton from Andy M. enlightening proceedings with upbeat analysis. Mr. Hall concurs but notes the effects of an absent Chairman. Invigorated and uplifted, Stuart B. has a light bulb moment as he digests Landlord Bill’s insight. 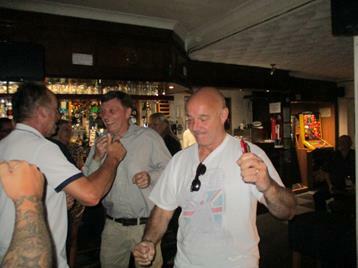 .....as Stuart’s improved demeanour saw him launch into a display of his Samba skills at the Kingsway Liberal Club. Strictly speaking the display was a demonstration incorporating elements of Samba, Fado, Tango and an obscure element of Yellabelly Pagan ritual, Strictly speaking! Lisa alerts various news channels of developments. McMike cannot believe his eyes. 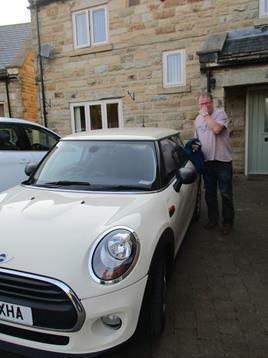 As the word spread of this momentous turn around, Kingsway Hotel Legend Innis (himself with showbiz roots), made a point of welcoming Stuart safely back to base-camp. The Shakers at Gigg Lane since 1865, entered the League in 1894 alongside Man.City. An illustrious early history alas overshadowed by more prominent noisy neighbours......!!! F.A.Cup Winners 1900 and 1903, Bury are the only club to score 1000 goals across all the top 4 divisions - achieved May 2005. 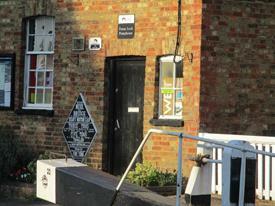 The birthplace of John Kay (Flying Shuttle - industrial hardware , not a band !) and also the grand-daughter of Alf Garnett i.e. Cherie Blair plus a brace of Nevilles.!!! The Shakers have developed many significant recent footballing legends including Neville Southhall, Colin Ball, Lee Dixon, Terry McDermott and Alec Lindsey. They also had Mariner Legend “The Shop” 2010-2012 and Marcus Marshall. However most significantly Bury is the home of Black Pudding! Unfortunately rain precluded a walk to Bury Market to fulfil orders taken from further South. 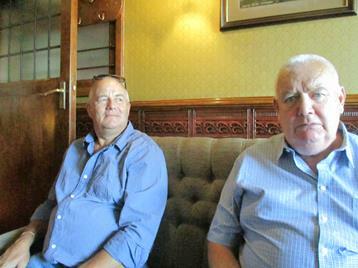 Inside knowledge ensured Chesterfield Mariner, Gareth The Engine — work colleague of Ivor and Jones The Steam, from the “top left-hand corner of Wales”, for the Llantisilly Railway Traction Company Ltd. — arranged pre-match sustenance at the magnificent Trackside. International call-up prevented TM to witness the arrival of the Royal Scotsman courtesy of Gareth’s already accredited industry associates and also Evan The Song and Dai Station the Stationmaster at Llanrog. Gareth concentrates whilst in total control of proceedings leaving Grace to proudly gaze in awe whilst The Fish contemplates the enormity of the occasion. Long suffering wife, mum Becky texts and informs Mrs.Porty of the potential dilemmas of a Spirite future. Aunt Charlotte keeps Ggrace on track, whilst elsewhere Joe despairs in isolation of the route being taken by Mad Dog. Recent concerns over the Mighty Mariners had not dampened The Fish’s enthusiasm, as he prepares to stride positively forward with able back-up from Mrs.Fish and Lou on a well deserved break from the White County. 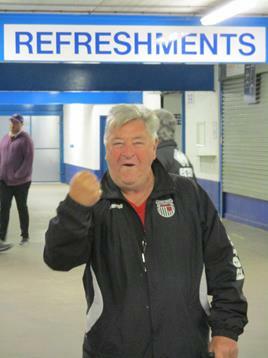 ...Lord Roy completes his pre-match ritual. The B&W Army made a magnificent effort (886) indicating continued belief. The bed-rock of Real Fans can only be commended for their commitment and resilience.At such times the brotherhood of support reminds everyone of the essence of The Campaign. Doncaster Paul with a very snug elderly lady, ready for action alongside Sgt.Dodd. 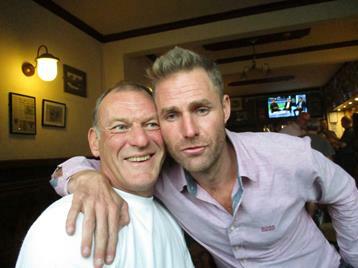 ‘Billy’ grateful of a mate, Stuart. 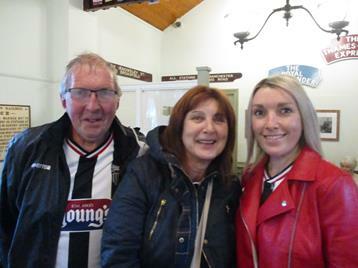 A rose between two Moore thorns. Lord Roy is admonished for elements of his pre-match ritual though applauded for his overall focus and leadership. Despite an early Shaker goal, Town had opportunities which par for the course, at present, were not taken. 2 v 0 at half tim, reluctantly made something from the game unlikely. Second half provided even more disappointment with a number of below-par performances. Mitch Rose struggled in vain to provide some resistance. We are in need of collective support. 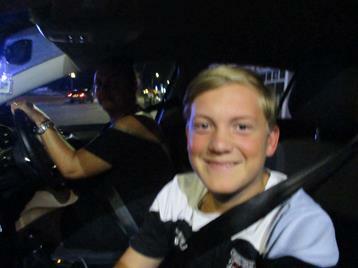 The Histon Mariners were delighted to have two significant debutants of such local standing. Jim Kelly immediately proved his suitability for the occasion with an enthralling monologue re. his days as a customer at Fortnum & Mason (obviously the Piccadilly Branch !!) and in particular the memorable occasion he bought cakes and pastries, proceeded to take them home and ended up throwing them out. Given the enormity of the plight, Jim’s strength of character shone through by maintaining focus on the job in hand and it could well transpire such procurement skills and intensity of focus will be utilized in the future. Once established at base-camp, Messrs Kelly and O’Munnelly soon immersed themselves In the atmosphere and occasion. 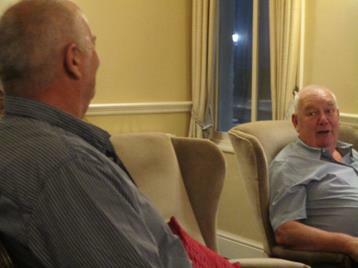 Jim’s buying skills were a hot topic of discussion at “Think Bubbles”, the favourite women’s clothes shop of the Chairman of Wainfleet Mariners. 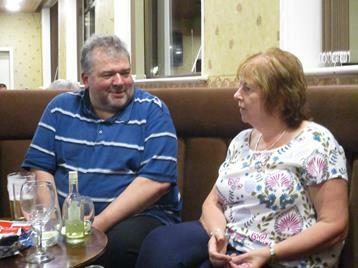 Maureen soon took advantage and phoned around making use of Jim’s contacts and advice. 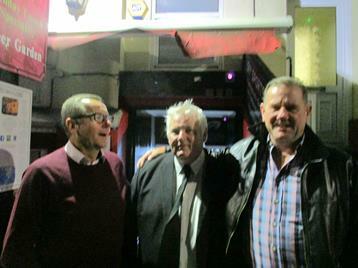 As ever a genuinely warm welcome greeted the Histon Mariners at McMenamys. 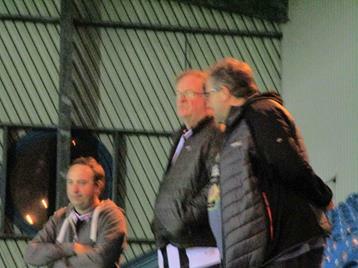 John Fenty and the Legendary Leeson greet Franco O’M and Jim K.
....whilst Mr.O’M checked form as kick-off approached. A fairly even first half, with Town becoming marginally more prominent as the half progressed sounds a little repetitive but true. Charles Vernam and Wes Thomas again look on the verge of impacting without getting over the line. The loss of Jordon Cook hardly helped. Oldhams change of tactics to a more direct approach saw the advantage swing to the Latics. As seems to be a fairly regular pattern at present, the first goal proved decisive, a quick second saw Town again struggle to respond and adapt. A bad day at the office (again). We march on in Unison, in MJ we trust and hope. Perspective is vital; the doomongers are as bad as the fantasists. Town are neither marching on as desired or in the depths of despair. Transition, change, evolution, building foundations are difficult in an era when 3/4 results can determine the outlook that triggers knee-jerk reactions. The faith and optimism remains, albeit within the parameters of reasoned logic. Meanwhile Lisa heads home for an evening quietly reflecting on matters to hand, with a couple of vegetables. 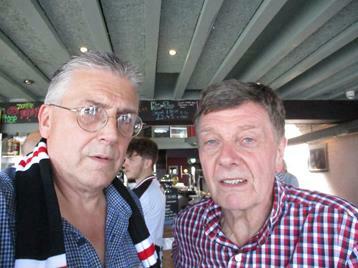 Histon Logistics Guru and ‘Billy’ relish the battle ahead. Post-match analysis was as profound as ever with the additional input of the two latest recruits who additionally looked to heaven for inspiration. The Councillor also partook of numerous ‘Spot The Ball’ opportunities. Given he was asked for no financial contributions, he declared his faith had been repaid. Years of devotion it appeared had produced a new found belief, consequently the Councillor had several goes. However far from Divine Intervention, a more earthly explanation emerged. Mr. Kelly had covered the costs and The Lord failed to produce any winnings. Given Mr.O’M, witnessed the Mariners defeat, his lack of success in McMenemys raffle, the New Imperial ‘False Revelation’, a suggestion arose that the Councillor could be called Jonah. 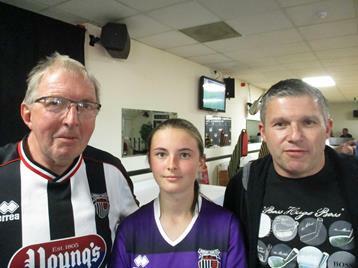 At the Notts, Emma (nee Lawlor) from Cleethorpes raised the issue of a new ground. Keen to consult with the Histon Mariners, an exciting scenario was presented whence the Peaks Parkway project would be replaced by an exciting renewal and invigorated Dockland/Freeman Street project with possible public money part enabling. The fortuitousness of history had struck again. With the Councillors vast knowledge of Local Government and his wealth of experience of major civil engineering projects, the fact that he was on hand, the idea of Divine Intervention did not appear so absurd as previously thought. Without hesitation Mr.O’M was appointed Histon Mariner Director of Urban Regeneration and Engineering Projects (UREP). The Councillor immediately began his unique and shrewd analysis at which Mr.Kelly could only look-on and admire. The overall impact of the debutants contribution to The Campaign, was astounding and bodes well for the future of the Histon Mariners. Acceptance of the impact of the ‘deadly duo’ was clearly demonstrated by the enthusiastic welcome awaiting them on return to the Kingsway base-camp. ....who immediately organises a bedtime Horlicks. The following morning, ???????? was anxious to meet the newly appointed UREP Director, she was surely not disappointed. The answer would no doubt be illuminating: the answer would likely be along the line of “Once a Pxxxx always a xxxxK”. A trip to Carlisle cannot be passed without the inevitable re-iteration of the proud link between The Cumbrians and The Mariners. Mr. Shankly’s first managerial post at Brunton Park 1949-1951 was followed until 1954 at Blundell Park. A major fundemental influence on the ethos of the Histon Mariners (See Origins) — the spirit of Mr. Shankly survives in many ways. Carlisle, the original base of Eddie Stobart, has been the launch pad for many significant careers including Peter Beardsley, Stan Bowles (early playing associate of Dave Boylen), Steve Harkness and Rory Delap. Carlisle was also the birthplace of recently departed Kevin Beattie. 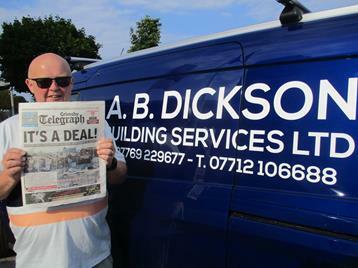 Current Cumbrian favourite, Jammie Devitt was Histon Mariner sponsored during his two spells at Blundel. All said and done the Mighty Mariners were in need of as much support as possible at this difficult juncture. 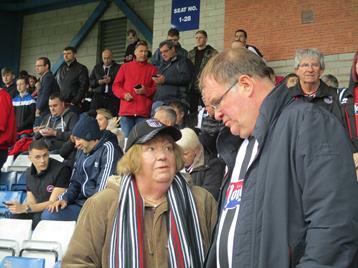 Carlisle away mid-week, would certainly be a difficult fixture for many of the B&W Army. 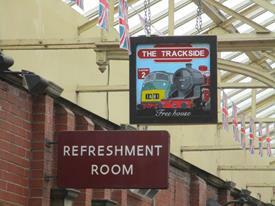 There was always an additional consideration, that Carlisle boasts some excellent refreshments venues. 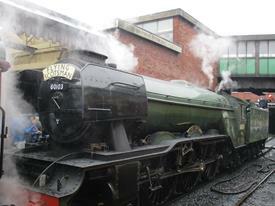 At Carlisle Railway Station The Spirit Of Cumbria provided a rejuvenating cup of tea that set up proceedings. 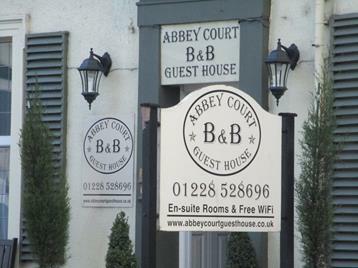 Fully refreshed, base-camp was established at The Abbey Guest House, a useful find for the future. 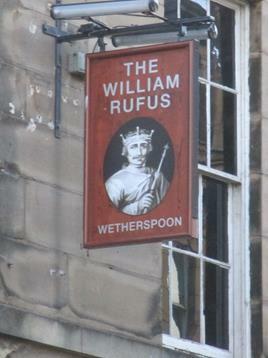 A predictably tense atmosphere, necessitated an intensification of preparation, following an initial stop at The William Rufus. 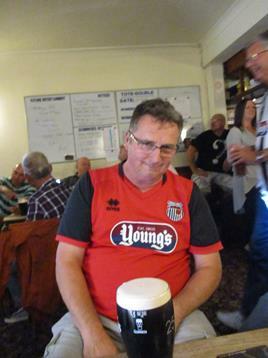 At Histon Mariner favourite, the magnificent Howard Arms, the liquid refreshment was on superb form, Here also Real Football Fan, Carlisle Dave was on hand to welcome the Histon Mariners and confirm post-match arrangements, which he hoped would not be too traumatic for the B&W Army. In Michael we trust and welcomed the post-match opportunity. 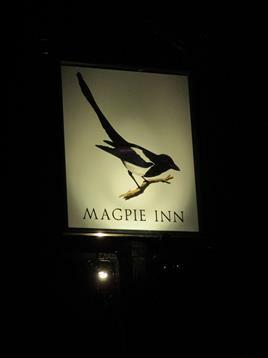 Suitably prepared and onto Chesterfield Mariner base-camp the commendable Magpie Inn. Quite understandably Innkeeper George (originally from Everton) was overawed to be in the presence of such high ranking nobility. Meeting Lord Roy, who recounted a most enlightening and inevitable outcome of 5 consecutive days of Indian cuisine, will undoubtedly provide Innkeeper George, material to be retold to customers for many years to come. P.S. The species of sausage selected by Lord Roy en route to Carlisle, has yet to be confirmed. Chesterfield Tour Manager Gareth’s late arrival could reasonably be accounted for by either his predilection for railways or/and Lord Roy’s dilemma. 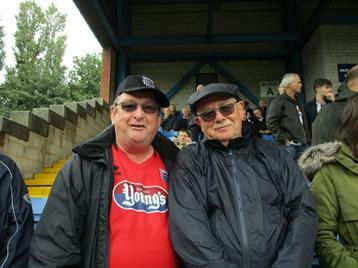 Normal service was resumed inside Brunton Park. Indeed Tefman was particularly anxious to ensure a rigorous commitment to prepaid dietary plans — a chicken Baltic pie was forthcoming. Given recent difficulties, a commendable effort by the B&W Army was clearly evident. 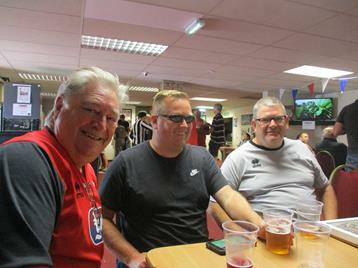 ...brother ‘Billy’, away on scouting duties, like the Histon Mariner Chairman, is always present in spirit (hic !). 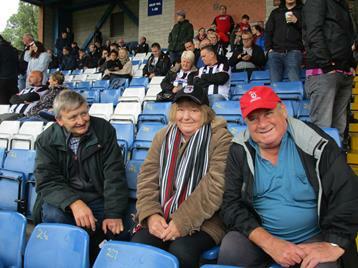 Derby Dan with Clee Kevin and tutor Helen (from Sc———-e) at her first football match. A more balanced Town side made possible by the return of Reece Hall-Johnson at right-back alongside Luke Hendrie on the left. Harry Clifton looked much more at home in the centre of mid-field alongside the combative Mitch Rose. Elliot Embleton, approaching match-fitness looks as though he could ill the creative since the injury to the other Elliot, Whitehouse. Ex-Mariner, Jamie Devitt left the pitch after a robust challenge from the no-nonesence Alex Whitmore who typified a spirited Town performance. Luke Hendrie’s first Town goal enabled half-time to be reached as the leading team. A battling second half performance reduced Carlisle to an impotent attacking force but when called upon, James McKeown reminded the B&W Army of his value to the team. Wes Thomas, like others mentioned, looks more effective with each game, his hold-up play increasingly valuable. As the injured return and full match fitness attained, the Mighty Mariners could well have turned a corner, as the violently bumpy ride becomes just a little smoother. Given the extent of instability and changes in recent times, both on and off the pitch, and with a relatively young squad, a turbulent ride was always, and probably still is, a likely scenario. But this squad has the capability of surpassing the expectations of many. So much depends on intangible aspects such as luck but also on giving the young guns opportunities to blend together. 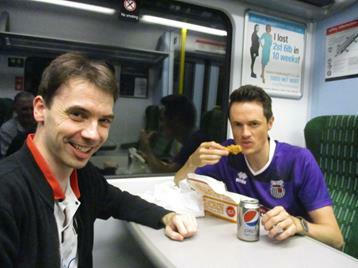 During the second half, TM ascertains whether His Lordship requires further sustenance - Gareth keeps a safe distance. 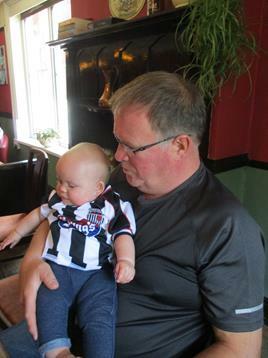 A very satisfactory mission was completed, as arranged, at the very acceptable Magpie Inn, where a curmudgeonly Carlisle Dave congratulated the Mariners through gritted teeth. Such collusion’s only continue to reinforce the Histon Mariner Campaign. 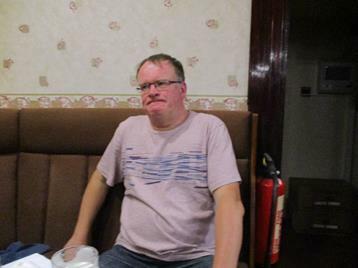 Whilst Dave displays a grimace, Gareth looks relieved to be a safe distance from his patron. 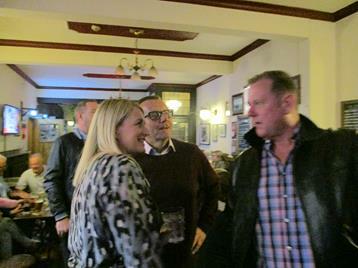 Later a final nightcap at The William Rufus witnessed a very intense Derby Dan reflecting on the musings of Chesterfield representative Gareth. The Carlisle Excursion exemplified the essential elements of the Histon Mariner Campaign. The realism of 4th Division football, the hopes and expectations fueling the logistical efforts to support your team. Returning to welcoming establishments, finding new and renewing old acquaintances. Being part of the heart and soul of a union of like-minded individuals from all walks of life bonded by the shared collective experience is The Soul of Real Football, of Real Football People (RFP). It is The Soul that has been lost from the Premier Pantomime due to the Corporatization of our game. The football tourism that now pervades throughout the upper echelons, has no comprehension of days such as this Carlisle Excursion. To also come away with a victory, whilst in one way the be-all-and-end-all, is also a bonus but however viewed the victory recharges the batteries and we march on!!! Important meetings were rumored to have been arranged on Saturday 20th October between representation from the Histon Mariners and the F.A.I. 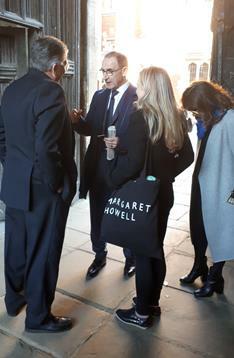 No record of such a meeting has transpired however an interesting picture has emerged of the Republic of Ireland Manager, Martin O’Neil, who was on other business in Cambridge on the day in question. the Republic of Ireland. There is as yet no reported link ......!!!!! A surprisingly small town of approximately 72,000 people but known to everyone because of its importance as a railway terminal. Once also a home of Rolls Royce and nowadays Bentleys. 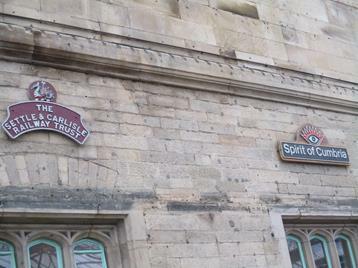 Such key factors made the small town of Crewe a major target for bombing during World War 2. 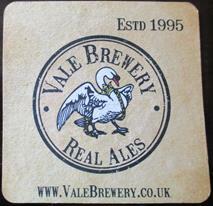 Formed in 1877 and named after Princess Alexandra. 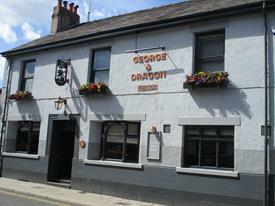 They were a founder member of the Second Division in 1892. Known as The Railway men, they recently spent 5 years in the Second Division from the late 1990’s - a significant achievement for a club this size. The Railway men have an illustrious list of players developed by the club’s youth set-up. From Frank Blunstone through to the more recent conveyor-belt of known names including Geoff Thomas, Rob Jones, Neil Lennon, Dean Ashton and Robbie Savage. Players for both clubs include Anthony Elding, Jimmy Pennington, Chris Clements and the current Histon Mariner sponsored Harry Davis. 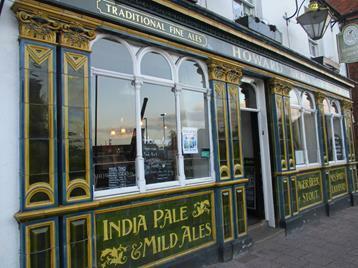 Arrival at Crewe necessitated a short respite at The Hero, prior to re-acquaintance at the excellent Hops. 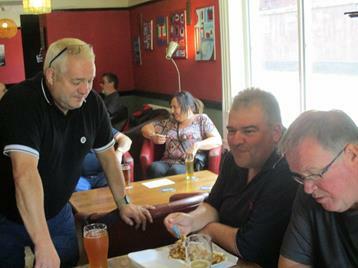 The return to The Hops was totally justified where in most convivial surroundings pre-match rituals were indulged in to everyone’s satisfaction. Given the acceptability of the refreshments on offer, delegates easily decided to stay-put. Lord Roy pronounces. Tefman subserviently agrees. Manager of Crewe Ladies Team Dave listens avidly to TM’s take on modern Sports Science and cutting edge Dietary Research. Enroute to Gresty Road, Derby Mariner Andy appeared concerned at the Tour Manager’s due subservience to his social superior, given his Legendary orienteering skills. Not surprisingly His Lordship proved the Doubting-Thomas’ wrong when explaining the logic of said signs - this alone was indicative of his duality of approach. 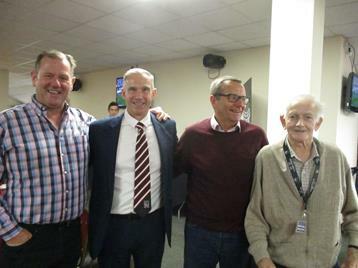 At Gresty Road a welcoming elderly lady, appeared somewhat relieved at the arrival of Lord Roy’s entourage. Used to the military honed skills of Sgt.Dodd and aware of Lord Roy’s track record, few people are more aware of the potential pitfalls faced by the oblivious andS untrained. The rolla-coaster ride took a downturn and a familiar story ensued. At half-time the B&W Army appeared confident following a satisfactory first half, that would be followed with the necessary goal(s) to continue the recent upturn. Clifton, Vernam and centre-backs, Collins and Whitmore had decent first halves. McKeown as ever proved the best shot stopper in the division. JJ Hooper forced the Crewe keeper to imitate Jamie Mc. However conceding one mid-way through the second half, was almost inevitably followed soon after by the second, which effectively ended Town’s day. The recent upturn was not expected to continue indefinitely but to turn back down old, well-trodden roads that were hoped to be behind us, was Of disappointing. 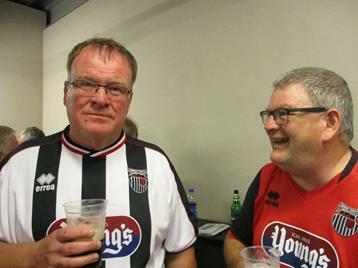 The result and match experience was still infinitely better than the previous visit to Gresty Road, which generally has not proven to be a happy hunting ground for Town for many years. The fragility of confidence is still evident. The winning habit is yet to be fully embraced. The mental toughness that follows goes hand-in-hand with this experience and MJ’s squad in transition continues on a very bumpy road. 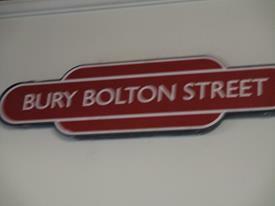 Crewe - apart from the splendid Hops - is not a destination from which the Mighty Mariners expect. 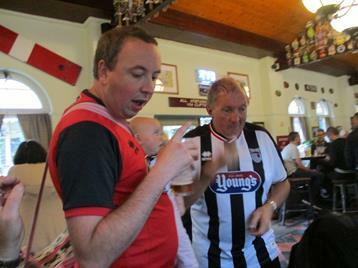 The only ‘home’ game of the season for the Histon Mariners, who were delighted to accompany experienced Tour Guide ‘Judith’ and the Old Gits on their Tour Of Duty prior to the following days excursion to the Abbey. With clear evidence of extensive planning, underpinned by years (many years !) 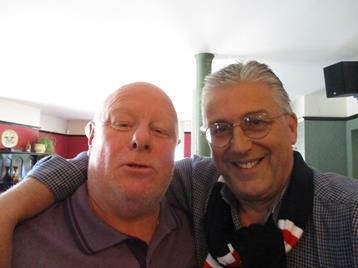 of experience, the Old Gits met up with the Histon Mariners for a mid-season review, collaboration and forward planning seminar at the unfortunately Greedy King owned, but nevertheless excellent Portland Arms. A remake of The Good, The Not So Good, The Bad and The Very Bad, The Ugly and Very Ugly was discussed but later abandoned due to an inability to decide on those most suitable for which roles. 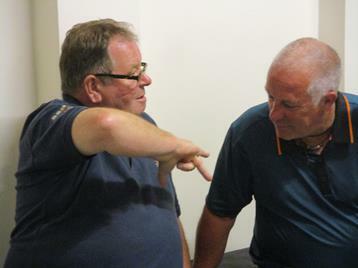 At the Seminar, a particularly animated dual presentation was forthcoming from Pete and Stuart with Big Steve overcome with admiration. A grand finale from a Neil Sedaka look-a-like producing a Bruce Springsteen rendition, ensured the Seminar ended on a sober, reflective but never to be forgotten moment. Such was the gravity’s of the occasion, local dignitaries attended to collude with the visiting Mariners. Two revered gentlemen associated with The Heart & Soul of RFP met to exchange seasonal goodwill and intelligence. Mariner Dave “Judith” Roberts and former Cambridge Utd. Chairman Dave Doggett, collectively exude The Voice Of Reason. 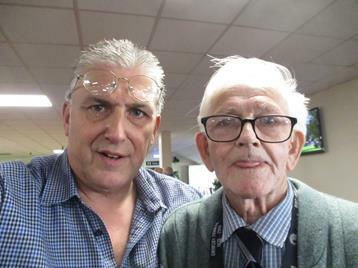 Real Football People like the Daves’ are doing and have been doing their upmost to serve the cause for many years, and in so doing helping to preserve the Soul of Real Football. Match day preparations in Cambridge are logistically difficult because of the location of the ground, meetings are therefore widely dispersed. 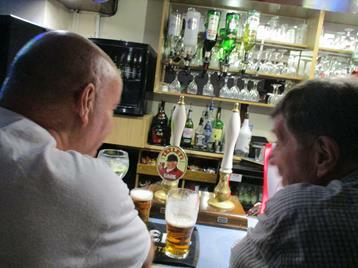 The Histon Mariners welcomed many to The Railway Vue, Impington. Ongoing analysis of the turbulent ride so far this season was inevitable, as was the usual serving of football chat that is so well preserved in the timeless web of the great ancient football tapestry. Memories of past meetings, disputed decisions from decades ago, hopes for the future and the curse of the Premier League and its ill-gotten gains, feature on agendas across the country. Who were the players who’d played for both teams ? Tom Newey, a brace of Scott’s - Garner and Neilson, Ian Miller, Nathan Arnold and Richard Tait, all names conjured up by aged fans who still tackled such critical issues “in the old way”, without resorting to the cursed technology! But The Histon Mariners whilst for ever mindful of the wealth of the collective voice of past fans, fully appreciates the need for new growth. President Maurice was on hand to oversee proceedings and in particular Youth Graduate James, anxious to fully embrace the occasion. James a keen student of local transport, recounted recent travel experiences from the Red Lion Histon to his home, nearly 800 yards away via taxi. With such an avid interest and with such clear signs of natural talent, the President suggested that James book a taxi from the Railway Vue to the Abbey Stadium for later, after refreshments were concluded. Obviously confused at the size of the task, the Logistic Director was more than willing to step in to assist James when he asked, “Where should we be picked up from ?”. A valiant effort by James, and with help and collective comradeship available within the B&W Army from the likes of taxi expert Lord Roy, Orienteering Guru, Old Git “Judith” and Gareth The Engine, we are confident James will grow in stature and assume a prominent role like the afore mentioned deep-well of collective expertise. 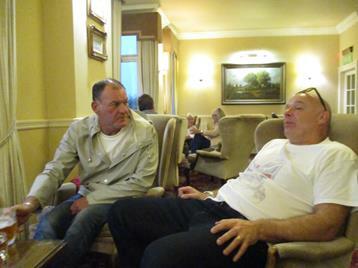 Eventually, travel arrangements were successfully confronted and once inside the ground, the Old Gits Tour of Duty was still in progress, continuing to indulge in the culinary delights on offer. 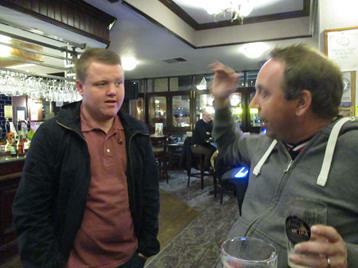 Doncaster Paul and Agent 006.5, Tim look on in astonishment, with a diplomatic “No comment” from Derby Mariner, Andy. Based on intelligence from Donny Mariner Paul, The Engine points out to a concerned TM about diminishing pie supplies. Youth graduate James, was clearly searching for recognition whilst aspiring to the dizzy heights of expertise and culture demonstrated by so many in the B&W Army. When asking his mentor, Maurice “What is Bovril?”, his potential for catering clearly matched that for logistics. Not a great day at the office. With both teams in a similar situation, the first goal was always likely to secure the three points. Evenly balanced, Town had chances but as is currently a regular occurrence, none were taken. Inconsistency is to be expected from a young team in transition but whilst often playing well in patches without capitalising on those spells it is always likely to result in “being bitten in the backside”. Ultimately results define the situation. RFP try to see things in context. They appreciate the inevitable highs and lows but need a regular ‘fix’ of hope. At present the turbulence creates violent storms and waves that ravage the terraces. Transition to a calmer weather pattern with gentle breezes and slight splashes washing onto the terraces would make life easier to rationalise. Ben Pringle on his first start, gave cause for optimism. There was distinct evidence that he will provide creativity and balance from the left. Together with Elliot Embleton, who looks better game by game, an interesting partnership could be in its embryonic stage. Wes Thomas battled bravely in isolation. And hopefully Alex Whitmores early departure through injury will not prove serious. 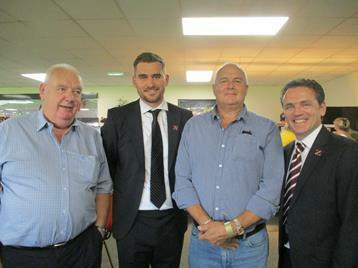 In Michael Jolley We Trust & Support. by fellow travelers, who themselves have a chequered logistical history. In all, the spirit of Noblesse Obligee, lives on in Hasland. 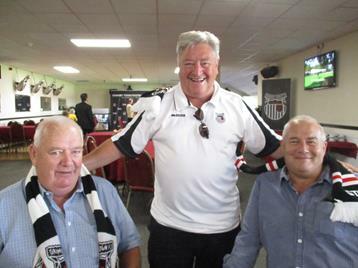 The almost hysterical clamour for the Chairman to attend in Cleethorpes was to be overwhelmingly satisfied after what seemed an inordinate period of time. Crawley Town on hearing the news must have wondered what they had done to deserve such fate. 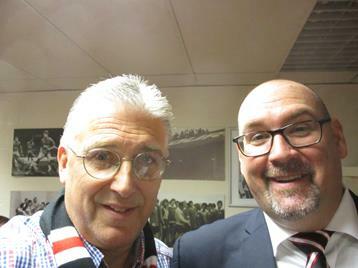 “THIS BOY” was determined to give The Histon Mariner Campaign a significant boost at a key moment in The Jolley Era, with his forthright, dynamic and as ever measured insights. At Willys, the Chairman gathers his thoughts. 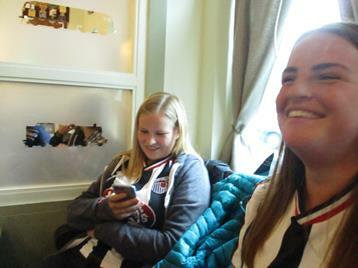 At Willys, a final cup of tea before The Chairman begins. The Histon Mariners are spellbound as they listen with eager anticipation. 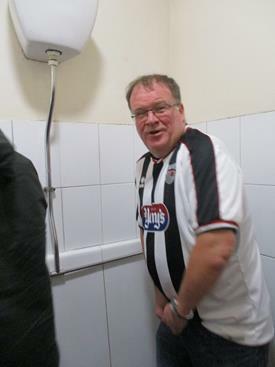 An unbelievably focused Chairman prepares in The Notts, with his customary attention to detail. Spellbound, the President, Fitness & Restoration Director and East Anglian Development Officer confer to assimilate the Chairman’s thoughts. Likewise at McMenamys, The Chair offers food for thought. It is difficult to avoid emotional reminiscing about past exploits of sporting icons, when in the presence of such sporting giants as The President, Maurice. 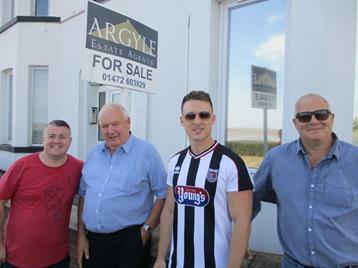 Former associates of the President often take the opportunity to trip down Memory Lane when he visits Cleethorpes. Mr.Dear takes note as former teammate Steve recounts the many miraculous tap-ins by The President after his own forgotten hard labours. Mike Robinson backs up Steve’s memories expressing his own admiration as to how the President invariably left the pitch looking as if he’d just arrived. 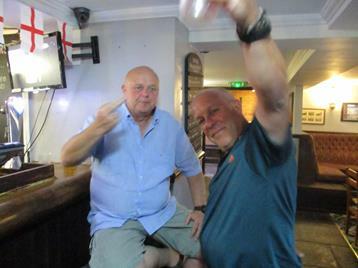 The regular greeting and toasting of The Histon Mariner Campaign by associates on their arrival at Blundel is never taken for granted and warmly appreciated. A rose between 2 thorns. Lindsey offers A Toast, with Steve F. looking bright and breezy and Paul F. a little more studious. 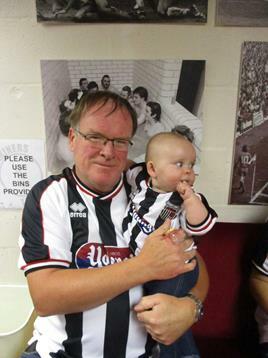 Meanwhile in the spirit of The Campaign, older, old associates pass on the ethos to the younger fans. Very old campaigner from Caistor Mariners, Pez, explains to a bewildered young Max, to “STAND UP” and take note. An attacking formation was favoured by MJ but when an opposition arrives looking to take a point, are constantly “in yer face” and a referee appears ill-prepared at best, the only desired outcome is three points. On that basis a successful mission ensued. The midfield missed the creativity of Elliot Embleton - away with England U20’s - especially in current circumstances. Ben Pringle is cementing his plaice and increasingly a key team player. Wes Thomas continues to plough his lonely furrow. The consistent Luke Hendrie and Histon Mariner sponsored Harry Davis quietly impress. 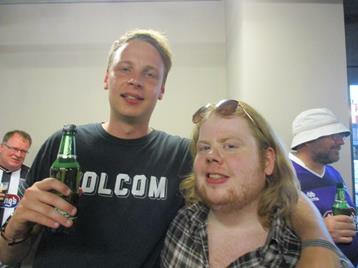 In the same vein the long awaited return of Harry Cardwell and Andrew Fox adds energy and strength in depth. James McKeown’s contribution is like a direct debit — regular and predictable. However in a function-able rather than exhilarating performance the highlight was the Akheem Rose cameo, capped off with his first and the decisive goal. The continuing development and utilisation of younger players is most welcome and strongly supported by the Histon Mariners but such a project demands patience, tolerance and understanding. 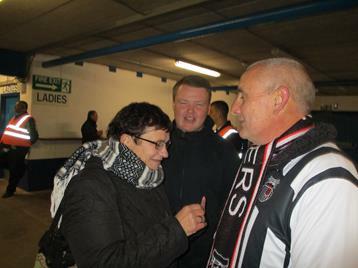 Immediately after the game Trust Representative Jon Wood, representing the Main Board, sought out the Histon Mariner Chairman to thank him for his continuing leadership and especially recognizing his distinctive contribution to the day. The President and The Fish compare notes. The Chairman announces the need to review proceedings. Beforehand The Fish looks to introduce Sophie to The Chm., in an effort to ease her missing of John Boy. The Dean gives the thumbs-up to a clearly ecstatic Sophie. 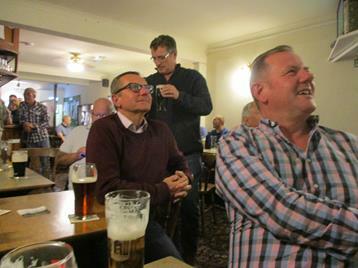 The initial post-match analysis traditionally occurs at the New Imperial Club, a venue deemed to be conducive to sober reflection after an adrenaline infused match day. The Chairman began an incredibly thoughtful analysis, which as ever provided a unique line of thought. 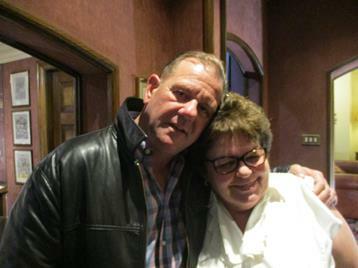 Linda, a grateful recipient of the Chairman’s analysis can only marvel alongside a proud President. 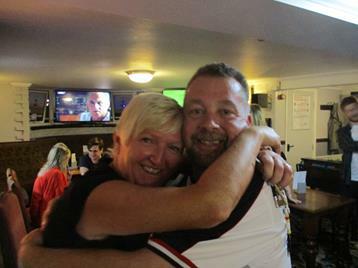 Reflection continued at the newly created Dock Beers, where The Histon Mariners hope to visit regularly on excursions to Cleethorpes building an association with Mariner Will Douglas and his team. 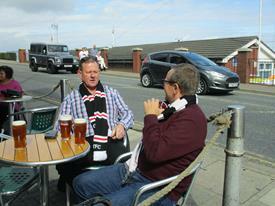 Dock Beers certainly appreciated The Chairman’s attendance and his technical advice and knowledge. Relentlessly, The Chairman grabbed the opportunity to approach the subject of Fitness and the contribution of recent Dietary Scientific Research with The Dean. His knowledge and his commitment as illustrated by his very own personal and rigorous regime serve as a wonder to us all. His desire to continually extend scientific boundaries in the interests of The Campaign are breathtaking. Obviously concerned, the Histon Mariners enbloc sought to help a most traumatic situation. 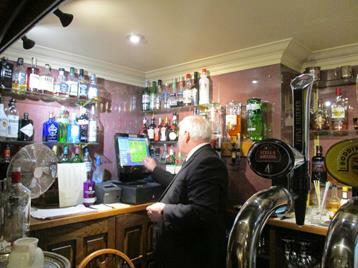 At the No.2 Bar, The Chairman points out the the way forward, with or without the lawn mower. The Histon Mariners remain in awe. .....whilst Lisa proposes a toast. An exhausting and enthralling but ultimately rewarding day of Campaigning led by The Chairman, in a way only he could. The insight allowed into “ A DAY IN THE LIFE” of The Chairman proved truly inspirational, setting an example to which we can only aspire and which ultimately re-energized The Campaign with renewed vigor. Without graphic evidence it must be taken on trust that such an extraordinary event occurred at The No.1 Bar, that failure to record both was inevitable. Whilst The Histon Mariner Chairman was at his enthralling best captivating the attention of The Histon Mariners, The Chairman of The Wainfleet Mariners was simultaneously giving a speech with equal vigour. Looking to raise awareness of Remembrance Sunday, alongside the efforts of The Mighty Mariners, Stuart B. called for 15 seconds of “Silent Clapping”. This new innovation will no doubt deliver significant future benefits for which Campaigners on all fronts should be grateful. Both Chairman lead with a quiet sense of dignified authority, never courting the trappings of celebrity. They will for ever be celebrities of a certain distinction in the eyes of Mariners everywhere.....!! !